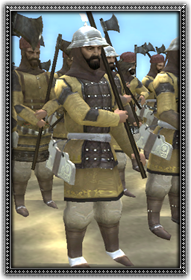 The main role of the Tabardariyya is to guard the Sultan and the palace. Armed with a large axe, 'tabar', similar to a traditional Scandinavian axe. These well armoured, elite troops are formidable on the battle field too.